To find the Nintendo DS guide, please click here! The main 'puzzle' you will play in this game is a game similar to Reversi and Go. You will have to turn the chips on your board and convert them to your Neopet's colour. You win by either converting all pieces to your colour or by having the most of your colour on the board when the whole board is full. You will train the stats when you level up in the game. So whatever species you choose, you can always upgrade their stats. Your stats will be used for special icons on the board, which I will explain later in this guide. Character Creation Screen After having chosen your species, they will ask you for the gender of your species, this will not influence their stats in any way. Secondly, they will ask for the colour of your Neopet, which will add some extra stat to your Neopet. Finally, you will be asked to enter a name for your Neopet. There is a preset name for you in the box, but you can change this to whatever you like. Single Player Info After having created your character you will come to the menu screen you will always see when you load up your character. You will see a 3D version of your character with a couple of emoticons above it. Whenever you click on one of those, your character will show that emotion. This has no function in the actual gameplay, though. There are seven buttons surrounding you character. These hold items or petpets. On the right you find a menu with several options. We'll now go through the options of the game on the right hand menu. If you click play story, you will enter Neopia and follow the game's story. You will start out on a map of Shenkuu, where you will have to guide your character around. On the map you see several locked places. You can't go there yet. They will be unlocked as you go on with playing the game. The storyline basically develops all on itself. There will be a main plot (golden ? and !) and several sub-plots (silver ? and !) as you continue your journey. Make sure to always do the sub-plots first since they might not be available anymore after you have finished a part in the main plot. All missions will reward you with neopoints (only in-game) and experience points. It might happen that the subplot is in the same place as the main plot. In this case you will only see the golden ! or ? rather than the silver one. So if you ever cannot find the silver one for the subplot, just go to the golden one! Thanks to these experience points your character can level up! This won't increase how well you can play the game, of course, but it does have several benefits. When you level up you get some bonus points, you can spend these bonus points on either one of your stats. For example, you level up and get a bonus point. A screen will appear with your stats current level on it, and you can select which one you want to level up. The reason you will want to raise these stats is because they give bonus points when putting a token on a coloured tile, a gem. Next to these stats points you get you will also be able to wear more armor. Weapons can be used in the battle game to cause several effects. Shields and the like will be used to block attacks from the enemy. The armor and the stats together will be a huge advantage towards the battle principle of the game. The way a battle worked is shown in the youtube video, to be found here. In battles you also make use of petpets you have captured, tamed and trained. 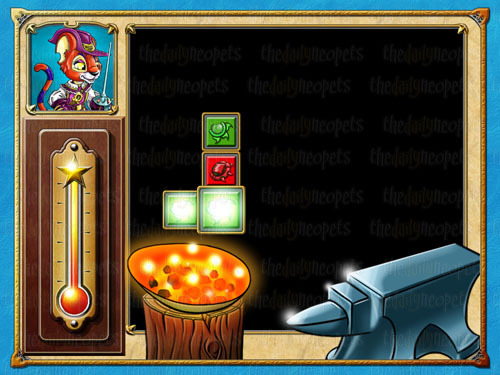 How to capture a petpet will be perfectly explained in the game itself. 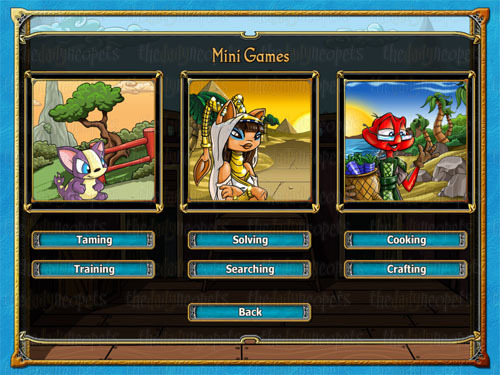 Taming and training the petpets is also one of the options in the minigames. 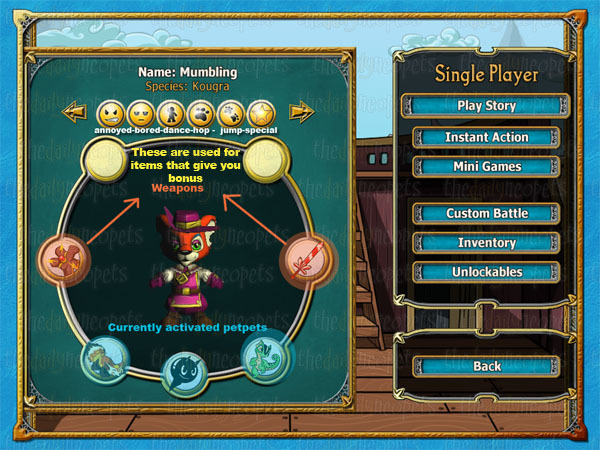 You tame your petpets so that they reach level 1, and can be used as your partner in the game. If you train them to a higher level, you can use them more often. If your petpet is in level 1, you can use it once, if it is in level 2, you can use it twice. The maximum level for petpets is level 3. There are 100 different petpets in the game, all with different abilities. After you have completed the game's story and click this button again, you will be able to wander around the places you have been and catch more petpets. Instant Action lets you play a game of Reversi and Go against a random character from the game. This is usually a very simple battle. After finishing you will return to this menu again. On the bottom of this page I will be explaining the minigames. In a custom battle, you can fight against any opponent you have faced before in 'Play Story' mode by playing a game of Reversi and Go. This is different from 'Instant Action' since you will be able to change your opponent and will be able to change the board as well. 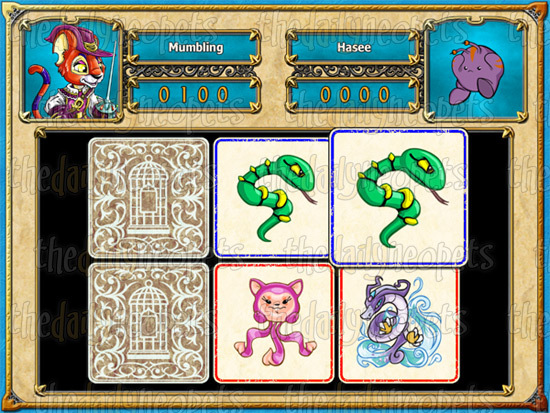 You will be able to choose from a number of boards you have unlocked during your game-play. The next video will show you a battle against a bandit leader. This is probably the most interesting part of the game; getting free neopets items from it while playing! In this section you will find a Master Code which you can enter on this page . After having entered the master code you can enter up to 10 other codes to get more items and complete the puzzle! 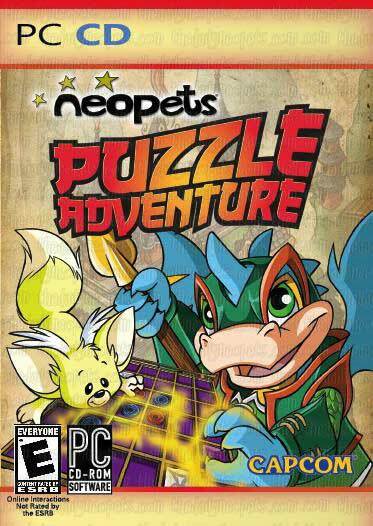 From every code you redeem you get Neopoints and two items related to Neopets Puzzle Adventure. You can also win a Site Theme. You can unlock the codes with the following experiences. The prizes you can get for the unlockables are listed below. You will start out with your character in Shenkuu. Totally amazed by the houses built on mountains you start exploring. Soon you find a Blobagus messing up things in a store. You decide to practice 'fighting' a bit before battling with the Blobagus. This is where you'll learn the basics. After beating the blobagus Linae, a pink Kougra, will talk to you and tell you about Cyodrake's Gaze, a big ship. In a quest from Anshu, an old Ruki, you will be able to learn how to catch petpets. After catching a Taigar for him, he will send you to help Hoban, the chart maker of Cyodrake's gaze. Hoban tells you that the ship is actually a flying ship! This is also where the first sub-plot appears. Finish the sub-plot and continue with the main plot. You will get your first real big battle soon, on an 8x8 square rather than 6x6. Also you will get a weapon and shield from the main plot. If you have finished launching the flares for Hoban you will have to learn to tame the Taigar you gave to Anshu earlier on, so that you can use it in a battle. Linae will send you out on a mission again. It's a good idea to catch petpets on the way you're going through the game, because some of them are very useful. 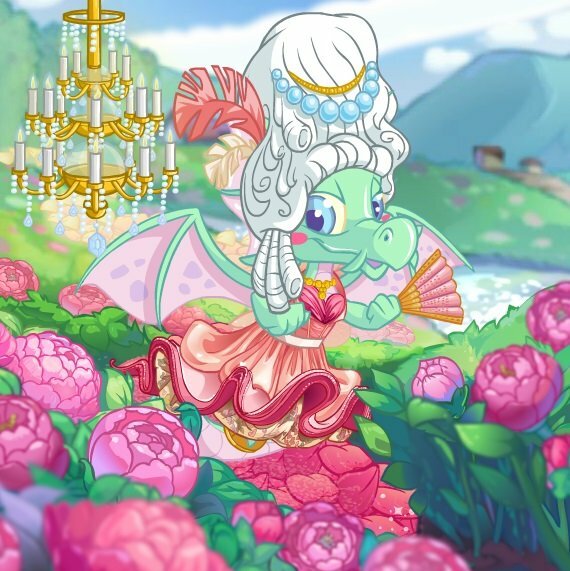 See my petpet guide(LINK!) on the bottom of this page. She asks you to help Orrin, a red Techo and yet another crew member. This talking to other crew members continues, you will even meet Chef Bonju who will challenge you to cooking something good. A while later, after you made some good Chocolate Cake, you will find meteorites falling from the sky. These meteorites hold Small Rock Monsters. You gather the crew members and help them with the last bits and pieces. Then you and the crew set off on Cyodrake's gaze! But what's that? An old Lupe is stuck between all kinds of Rock Monsters. You save him together with the crew and he tells you about this medallion that brings him bad luck. Greyfang, as the lupe is called, gives the medallion to you so you can visit the lunar temple and ask for guidance. Hoban tries to read the amulet, and while you are guarding him you will be attacked by the 'boss' of Shenkuu. Recommended for this boss is to eliminate it as soon as possible, because his 'burn' attacks will be seriously annoying. If you have beaten the Cyodrake leader you will end up in the Lost Desert with the ship. Deciding the look for help you notice a camp of tents. However, getting there, there seem to be bandits all over the place. You battle some bandit and run to the east, where you find a magical lamp and rub it. As you rub it a Shadowy Evil appears, and you fight it. When you have beaten it, it goes back into his lamp. Genius as you are, you decide to bring this lamp to the bandit camp. You surprise the bandits by rubbing the lamp and leaving them with the Shadowy Evil. You and Hoban return to the ship quickly. Captain Tuan sets you out for exploring once more. You find Linae who is seriously injured. She was stung by an aggressive petpet. Quickly you help her to get back on board of Cyodrake's Gaze. Captain Tuan tells you to find a Red Sunflower to cure Linae. After getting the sunflower for Linae, you're sent out to hunt down more bandits. After defeating the bandits you return to Kentari. The ship is having issues with it's hull and you need to find tools from the market to repair the hull. You meet up with a mysterious stranger at the oasis, who will tell you about your amulet and tells you that you need to find a fire faerie, Eithne. You are going to find her in a tomb, but you're attacked by the spirit of an evil king in the past. Beat the monster. Eithne will be looking for Calciferus while you keep yourself busy shielding off rock monsters. After this she will send you to beat Calciferus. You can't beat him at once, first you need to find an old amulet. Then enter the city of Sakhmet. In the city you want to speak to the pincess, but the guards won't let you until you have proof that you beat the evil. After you got the proof you need to find princess amira by playing minigames and you enter the tombs. In the tombs yo'll have to battle an old elephante. After beating him, Eithne will turns towards you and will attack you. You beat Eithne and meet up with another Fire faerie, who tells you to go to Mystery Island. You will have to fight everyone to make sure that all faerie wards are destroyed. First you will have to battle the Dark Faerie, Adriane. After battling her you have to battle Wasplin, the Buzz. Then battle with Sloven, the Fire Skeith. Our lovely Faerie Eithne will be the last challenger, she's laughing at the weak Dark Faerie. After having beaten her and have destroyed the last ward, you battle the final boss: Tura-Kepek. Beat him and the credits will show up. You will come across minigames as you play through the main storyline. However, in the minigames section you're able to play different versions of the minigame, and can also decide your level of difficulty. Both Taming and Training petpets is a memory game. There is one slight difference in the game. When you are taming a petpet, it is still wild and it will fight back to you. 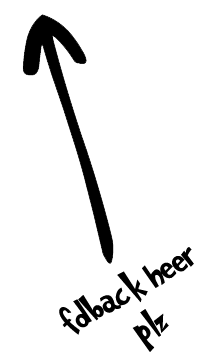 The picture above shows taming a petpet. The blue squares are mine, the red ones are from the petpet. When you are training a petpet, the petpet won't fight back. You will play a memory game on your own. When you are playing in 'Play Story' mode, you will actually level up your petpets by doing this. 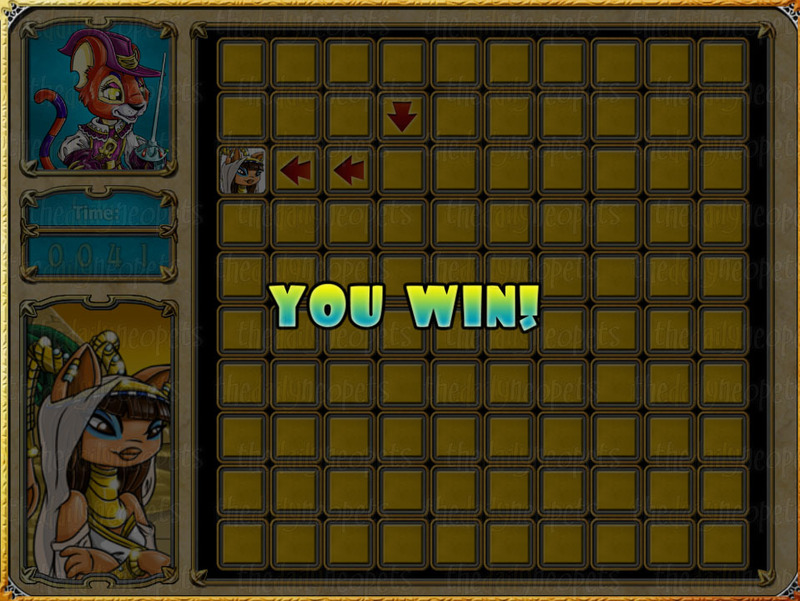 The main clue to get a good score in this game is by memorizing what your opponent (if there is any) has done. This is especially useful in the harder difficulty levels. The image above is the easiest level. In this minigame, you will simply have to click the squares to reveal an arrow or an empty space. The direction the arrow points in is the direction your item or the princess will be hidden. Items you find through this game will be added into your inventory.Finding the princess is the minigame that actually is played in the 'Play Story' mode as well. 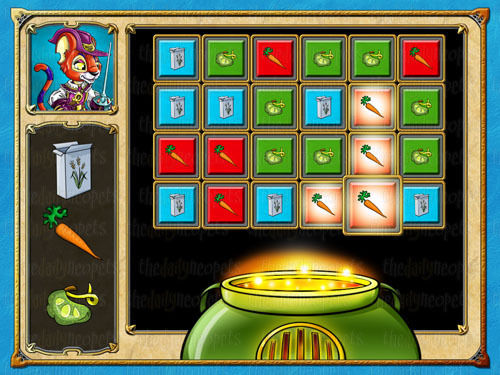 Cooking For Cooking, you will need to have 3 or less pieces on the board remaining when you're done clicking. This game is also in the 'Play Story' mode. Crafting For Crafting, you will need to have the heat meter on the left filled up completely. Making larger groups will fill up the heat meter more quickly. Make sure to save the fire icons for the last bit, since they will add an enormous amount of heat to the meter. This game is wonderful for getting some free neopoints and items on Neopets, you can also get a beautiful Site Theme. Hopefully this was an informative and useful guide. Have fun with your game! The Snowager is awake. He'll be sleeping in 36 minutes, 6 seconds.